Visiting Banff and Jasper National Parks in the shoulder season of April or May has its advantages and disadvantages. Spring comes much later in the mountains. 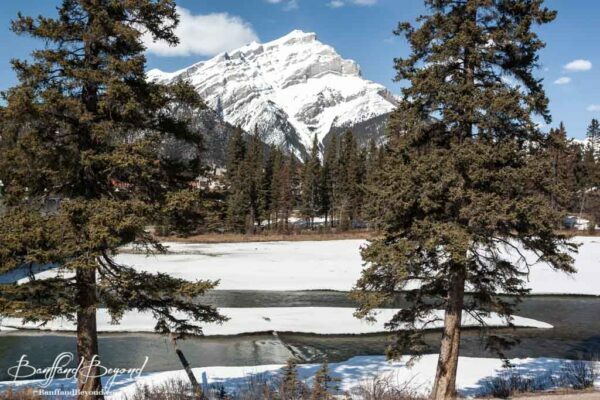 While areas of the west coast of Canada and other places may be enjoying blossoming flowers and warmer temperatures the Rockies are still trying to transition from winter. Whether you should visit during these months depends on what you expect to see and do. For general sightseeing, casual walks and lower elevation hikes it can be a great time. You just have to accept that there won’t be an abundance of activities. Spring can be excellent for skiing, but most winter time activities are coming to an end and the warmer weather ones have not yet started. The month of May offers more hiking options as trails start to clear of snow in the valley bottoms. Towards the end of the month there’s a lot more activities and seasonal attractions start to open. For suggestions of thing to do at this time of year see our post on spring time activities and hiking trails in Banff and Lake Louise and to get an overall idea of when the part of the year might be for suitable for your trip see our post on When is the best time to visit Banff National Park and The Rocky Mountains. Far too many people jump into booking a trip to the Canadian Rockies without doing enough research. They discover areas they wanted to see are not going to be accessible and they can’t partake in activities they are interested in. When they find out their trip is not going to meet their expectations it’s often too late. Time has already been booked off work and airline tickets and accommodations can be costly to change or can’t be cancelled. It’s not uncommon for visitors to think they are going to show up in the spring to canoe on the glacier lakes and go on epic hikes through the mountain trails. Then there’s the complete opposite where others are under the impression they can go dog sledding or ice skating year round. The climate and weather of the Rocky Mountains can be a bit of a mystery for people from other parts of Canada. It’s no wonder that it’s difficult for other countries to grasp the concept of the unique mountain environment. Not all areas are accessible at this time of year. Most of the main roads around the mountains remain open year round. However, there are seasonal closures on some of the secondary roads due to avalanche risks or to allow undisturbed activity in important wildlife corridors. Some of these roads are to popular and scenic places. The most notable closure is the road to Moraine Lake in Banff National Park. Many people have their heart set on seeing this beautiful lake and the Valley Of The Ten Peaks. Moraine Lake Road – Moraine Lake closes around the 3rd week of October and does not open again until the 3rd or 4th week of May. Take note that when the road opens you are not going to see the postcard images of the turquoise blue water. It remains covered in snow and frozen until around mid-June. When it thaws the water levels are remain low until late June or early July. Yoho Valley Road – in nearby Yoho National Park the Yoho Valley Road that accesses Takkakaw Falls does not open until mid-June. Miette Road – The road to the Miette Hot Springs in Jasper and the springs themselves do not open until early May. Edith Cavell Road – the road to Edith Cavell to the popular Cavell Ponds and Angel Glacier does not open until around mid-June. The popular hike accessed from the same area to Cavell Meadows remains closed until late June or sometimes early July. The mountain weather can be unpredictable year round, but even more so in the transitional months of April and May. The weather can be all over the place for both months. It can be cold, cloudy or snowing or there can be bright blue skies and warm daytime temperatures. If you’re booking a trip to the area at this time of year there’s no way to know what type of conditions or weather you will be showing up to until right before you arrive. If it does get cold the nice thing is that it’s not as bitter as the temperatures experienced from November through February. Large amounts of snowfall are not uncommon in April. It’s normally a bit more winter like than spring, but every year can be different. As an example the Banff average daytime highs can be anywhere from 3C. to 10C. in April and 8C. to 15C. in May. Keep in mind those are just the average highs, the temperatures can vary drastically beyond that. Even if it’s warmer in the day it can still get down to freezing or colder at night and in the mornings. It’s best to have different layers of clothing to adjust to the variance in temperatures. See our post on How to pack for a visit to the Canadian Rocky Mountains. To show how wide of a variance there can from one year to the next we’ll use today as an example Friday April 7, 2016. It’s currently an exceptionally warm day in Banff with a high of 16C. People are walking around downtown Banff in t-shirts. There’s not a spot of snow to be seen anywhere on the streets or sidewalks. As you look down Banff Avenue there’s not much snow to speak of on top of Cascade Mountain. It’s supposed to remain sunny for most of the following week with highs between 9C. and 11C., but then a combination of snow and rain returning by the end of the week. Here’s what the highest daytime temperatures in Banff were on this day for the previous 4 years. As you can see you just never know what to expect. Someone visiting today would think it’s downright balmy, where as someone visiting on this day in 2013 would be experiencing winter like conditions. April 7, 2015 high of 7.7C. April 7, 2014 high of 9.9C. April 7, 2013 high of 1C. April 7, 2012 high of 2C. For more detailed information see our post on What to expect for weather and temperatures in the Canadian Rockies. For avid hikers this is not the time to visit. The higher sup-alpine and alpine trails are snowbound until late June or longer. Unless you have specialized winter hiking equipment and training the options are limited. When temperatures are warming up in late winter and early spring it’s also a high risk time for avalanches. You need to use caution and find out the current conditions before doing any hiking in the area. As the spring season progresses the lowest valley trails around the town sites of Banff and Jasper will be the first to clear of snow. As the snow melts the trails can be icy or muddy and slushy. It’s not usually until May that they start to have a chance to dry up. There’s no way to predict what any trail conditions will be like ahead of time. Check just before or at the time you plan to hike. You can visit one of the Parks Canada offices in Banff, Lake Louise or Jasper upon arrival or look online. Banff and Lake Louise Trail Reports and Jasper Trail Reports. Camping is more of a summer time activity in the mountains, it’s pretty cold to camp any other time of the year. Be prepared for full winter camping from November through April, even May and October are questionable. There’s few campgrounds in the mountains that remain open year round, most are open from mid to late May and close again in early September to early October depending on the location. The May Holiday long weekend is the first busy camping time in the mountains. It’s the official kick off to the tourist season. Expect anything from warm and sunny weather to snow. Winter hangs on in the higher elevation of Lake Louise much longer than other sections of the Bow Valley. 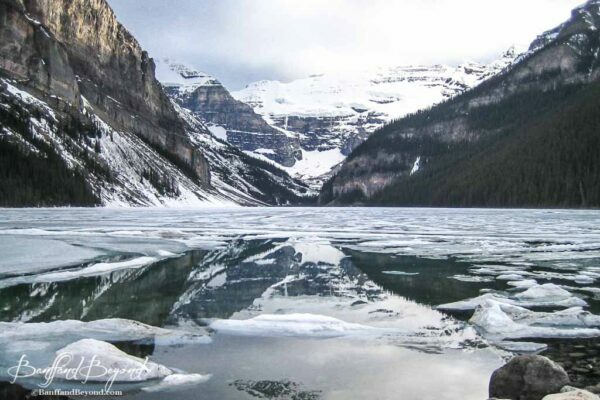 Many people have no idea that Lake Louise does not thaw until early June. In other lower elevation areas near the town site of Banff it can be warmer and sunny. The grasses are starting to green up and leaves are starting to come out on the trees, meanwhile in Lake Louise remains icy and snow may still be falling. It’s not only Lake Louise that remains frozen for a good portion of the year, most of the glacier lakes don’t start to thaw until May, early June or later. If your dream trip is to see the beautiful turquoise glacier waters of the Canadian Rockies, this is not the time. 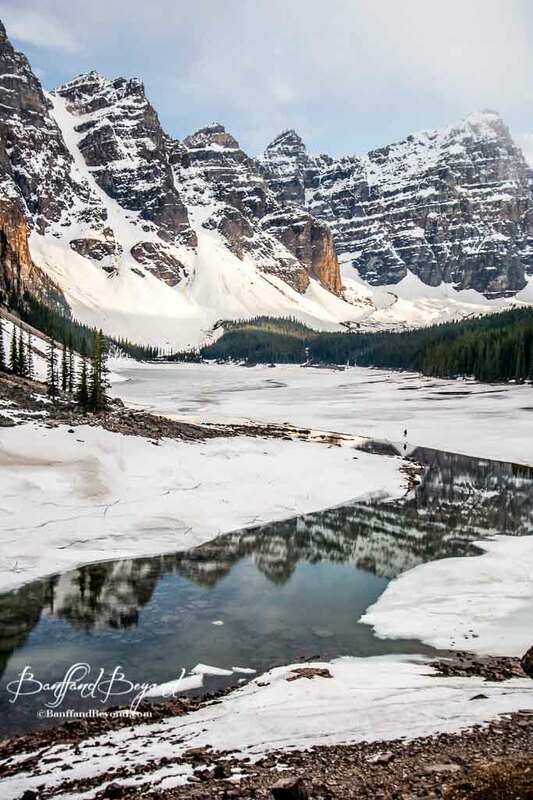 All the popular Lakes like Peyto Lake, Moraine Lake and Lake Louise will be frozen. Only the lowest elevation lakes will have begun to thaw, but they are not the ones with the intense colour that the area is known for. To plan your trip for the best time to see the lakes check out our post on When Do The Rocky Mountain Lakes Thaw And Get Their Beautiful Turquoise Colour? The driving conditions around the town sites are generally okay. There’s more chance of winter conditions in April. The Trans Canada Highway that leads from Calgary to Banff and runs through the park is well maintained, but once in a while the driving conditions become poor. If a large storm causes a significant amount of snow to fall quickly it can take a while for the plowing crews to catch up. It’s always best to check the conditions before you travel. AMA Road Reports. A highlight of the Canadian Rockies is the drive and attractions along the Icefields Parkway. It’s a higher elevation road that can have unpredictable weather. Driving it in winter is not something to take lightly. Even during April and May there can be anything from bare dry pavement to compacted snow and ice. It can be beautiful clear blue skies or a snow blizzard causing poor visibility. There’s no way to predict what the conditions will be like ahead of time, check before you drive. March through about mid-April is when the route can have the most frequent closures due to avalanches. In April the road side pullouts and viewpoints will not be plowed, there are few options for stopping or doing any exploring. It’s the warmer months that allow you to take full advantage of everything the route has to offer. For more information see our post on Tips For Driving The Icefields Parkway. The Icefields Center opens in mid-April to start the Ice Explorer Adventures onto the Athabasca Glacier, but everything else remains closed usually until late April or early May. Until then there’s no gas station or other amenities. Popular spots like the Peyto Lake viewpoint can require dredging through knee deep or higher snow. Using snowshoes is a much easier option. Until the parking lot is plowed it can be difficult to find a spot to leave your vehicle. 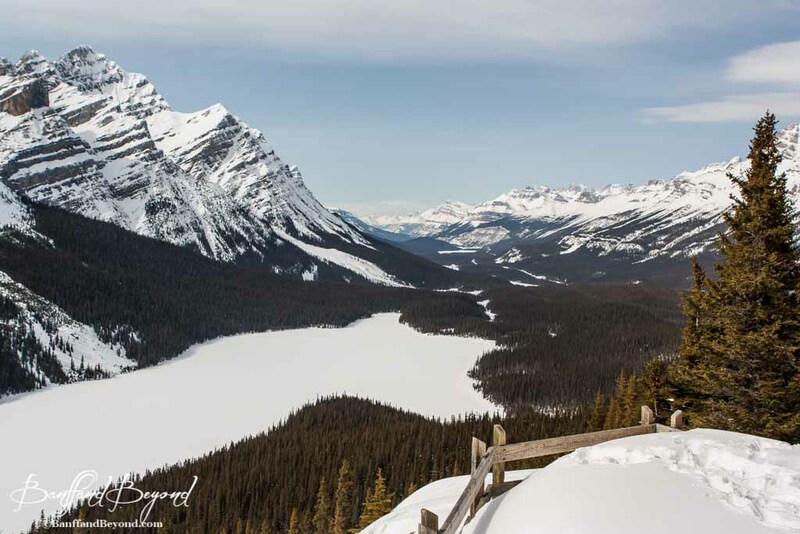 Check out our adventure to the Bow Summit And Peyto Lake Lookout In Winter. Spring time skiing in the Canadian Rockies can be fantastic with lots of sunny days and fresh powder. When many resorts in other parts of the North America have shut down the hills here are still open. There are 3 ski resorts in Banff National Park. 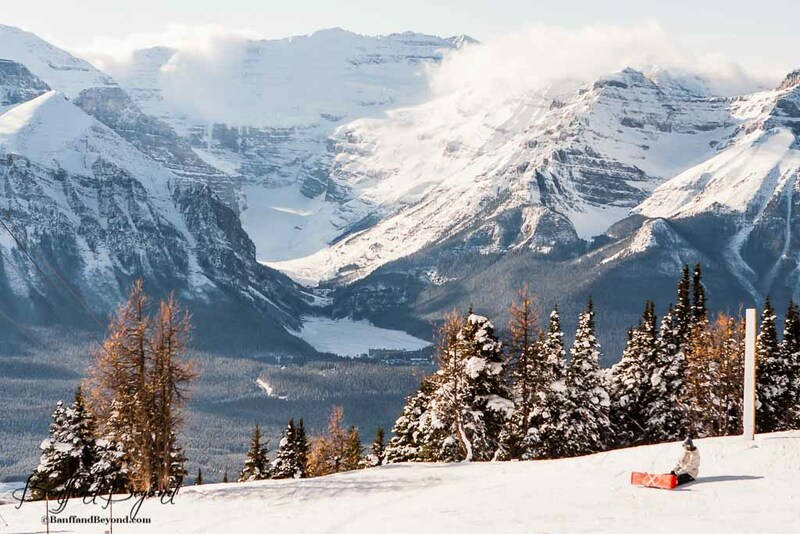 There’s the Lake Louise Ski Resort and near the town of Banff there’s Sunshine Village and Mount Norquay. Jasper has Marmot Basin. Depending on the conditions some of them remain open until mid to late May. It’s always best to check current conditions as they can vary from year to year. During the spring months the mountains are stunning with their snow-capped peaks. It’s a time when there is the possibility to see the white mountains tops contrasted against green grasses and fresh new foliage. Spring can be an excellent time to view wildlife. As the snow starts to clear from lower valley areas the grasses are exposed and the animals are drawn in to graze. 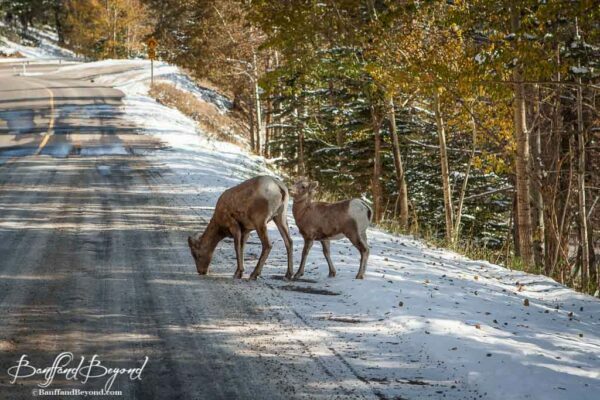 Around the town sites of Banff and Jasper you can start to see elk, bighorn sheep and deer. The majority of the bears start to come out of hibernation in April and early May. Spring is also one of the best times for bird watching. For more detailed information see our post on Wildlife Viewing In The Canadian Rocky Mountains. A benefit to booking a trip to the Rockies during a shoulder season is the lower prices. Accommodation prices remain lower until the Victoria Day holiday weekend (the Monday prior to May 25th). They are much cheaper compared to the high peak demand prices of the summer months. Tour companies offer deeply discounted packages during this time. Visitors from overseas often find that international flights are cheaper as well. But before you decide to take advantage of these lower prices make sure it’s worth it. They are discounted for a reason, it’s not the peak time of warmer weather and full access to all areas and activities. Don’t have regrets by booking your dream vacation if it’s not during a time that is going to suit you. Our post on How to visit Banff on a budget gives some more insight into the various accommodation prices throughout the year. The Easter long weekend sees large numbers of locals come from surrounding areas to ski. Otherwise April and May are much quieter in comparison to the summer months when there can be overwhelming crowds. You will be able to visit attractions like the Banff Gondola without the long line ups. Not all sights are going to be accessible at this time of year, but the ones that are can be visited in relative solitude. 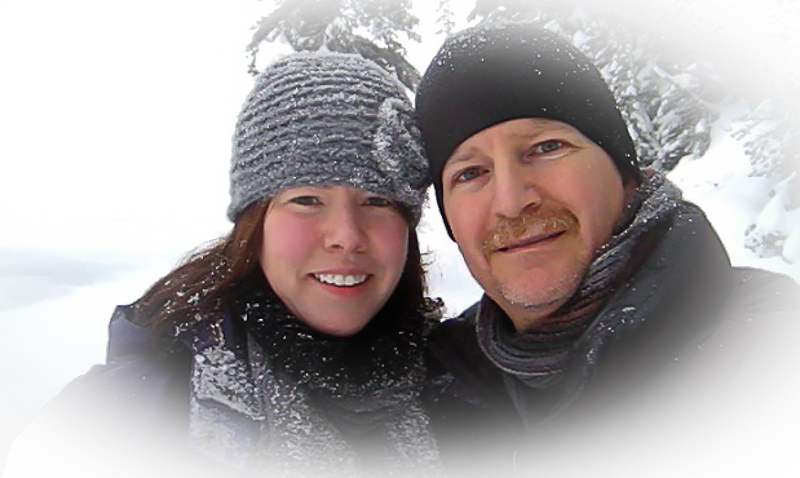 We are planning to visit the Rockies with 2 kids in late April. Do you have recommendations for easy and not muddy/snowy hikes? What else can we do if we are not skiing? What lakes will be accessible by car in this season? We’ll be doing another post shortly on spring time hikes, but they will only be suggestions. There’s no way to know ahead of time what hiking trail conditions will be like. They can change week by week and even by the day. The best thing to do is check with one of the Parks Canada offices when you arrive in either Lake Louise, Banff or Jasper or look up the trail conditions online for Banff National Park and Jasper National Park. Which is the same thing we do before going for a hike. For lakes, it’s just Moraine Lake Road that is closed, any other lakes that you can normally access by car such as Lake Louise are still accessible but they will all be frozen still in April. Thank you so much for your answer and your great blog! I am looking forward to your post on spring time hikes. I am aware that the lakes are still frozen but they still should be beautiful. Are there other activities we can do? Do we need some special equipment to hike in the Rockies except for waterproof shoes? Are snow pants required at this time of the year? It’s our first time at the rockies and we have no idea how best to prepare ourselves. Your website is a gem for those who wish to visit the Canadian Rockies. This August, I will be celebrating my honeymoon – let’s say mini honeymoon before the actual one which will happen in 2017 – in the Canadian Rockies. Although this will be my 3rd trip to the region, I am still going through your articles making sure I have every place worth visiting jotted down on my itinerary. While I am an American, my soon-to-be wife is Canadian whose family did a quick drive-by of the region way back when she was in high school. As you can imagine, this is very exciting for her and to help her be a little more familiar with the setting, I directed her to your website. Needless to say, she cannot wait till August. Let me be the first one to say, in case no one else has already said it, that I truly appreciate and admire your work. It is one thing to fall in love with your website because of common interest (we both love Canadian Rockies); it is another to appreciate the time and effort you have invested in putting it together. Furthermore, you address people’s concerns and answer their questions in great details and with extreme patience. Keep up the good work! You can be sure that no matter how much of an expert I become when it comes to the Canadian Rockies, I will always refer to your website for additional tips and pointers. Have a great summer and rest of 2016! The site is a lot of work, but it is a labour of love. To have someone take the time to write a thank you like this and acknowledge our efforts is very heartwarming. I hope you and your wife enjoy both your mini August honeymoon and your wedding and actual honeymoon in 2017. This is a most amazing and informative site, I feel very fortunate to have stumbled upon it! I am planning to visit Banff and Jasper National Parks in the first week of April 2017 with a family of 4 (2 senior citizens and 2 adults). In view of safety concerns, would it be safe to drive, how will the road conditions be like? In furtherance to Liana’s comments last year, is the only road closed the one to Lake Moraine? All other roads to the other lakes and attractions are opened? Thank you for putting up this wonderful website and helping us all! The main Trans Canada Hwy between Calgary and Banff and west to Lake Louise is well maintained. There can still be snowstorms causing poor driving conditions for periods of time in April. There’s no way to predict ahead of time what they will be like, in early April the weather can be all over the map. Moraine Lake is not accessible and it depends on what other lakes you are referring to. Peyto Lake along the Icefields Parkway will require a hike through snow to get to. The parking lot will not be cleared, it may be compacted down from other vehicles entering it. These high elevation lakes will all be frozen solid still. As far as attractions, it depends what you are referring to. The boat cruises, the Icefield Explorer that goes on the Athabasca Glacier, etc. do not start operating until May. The Banff gondola operates year round. 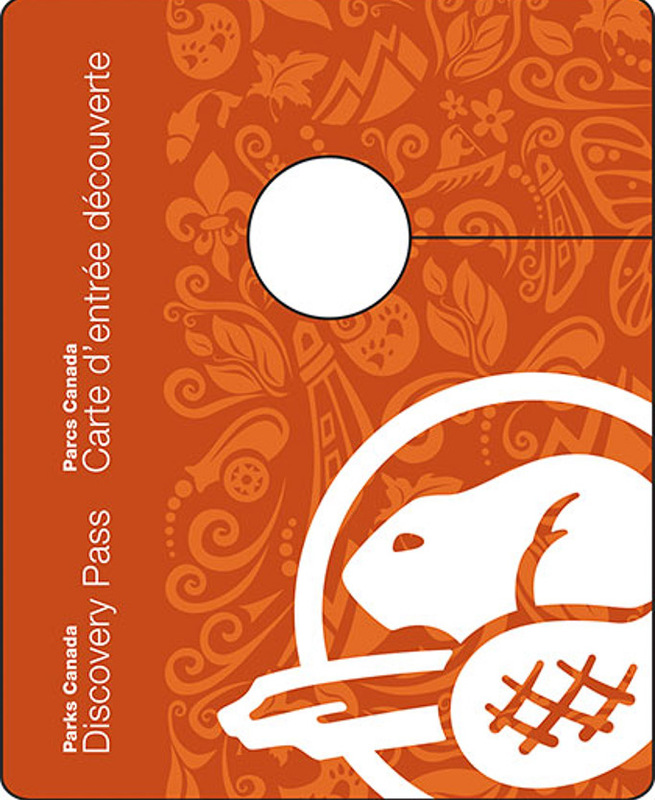 Need Help Understanding The National Park Passes?